Leading Audio Manufacturer Unveils Amplifiers Designed for Powerful On-The-Water Performance. FUSION®, a worldwide leader in marine audio, announced today the release of its line of hardened marine-specific stereo amplifiers. Purpose-built for installations on boats of all sizes, the new line of amplifiers is engineered for long-lasting performance. Offered in two configurations, the 400 Watt, 2-channel MS-AM402 and the 500 Watt, 4-channel MS-AM504 marine amplifiers are perfect for enhancing powerful audio performance throughout any vessel. The new FUSION amplifiers are housed in marine grade chassis with stainless steel bottom and end plates that provide a stunning finish and excellent environmental resistance. Conformal-coated circuitry adds protection from salt air and moisture ingress to maximize product life. Ensuring clean and powerful amplification of the input signal, the 2 Ohm per channel class AB design provides excellent sound quality. The units include regulated amplifier technology, which sustains high power outputs at the lowest voltage for greater efficiency and reliable performance, and enough power to allow the option of connecting an extra pair of speakers in parallel, ideal for a multi-zone system. A pass-through nickel-coated RCA output enables linking of multiple amplifiers for enhanced system performance. Stainless connectors and screw terminals improve signal flow for optimum output. "Our new amplifiers are designed to work with our ruggedized head units and speakers for a complete audio experience," said Chris Baird, Managing Director, FUSION Entertainment. "They look good and make any connected FUSION speaker or subwoofer sound better - even over the typical noise of an outboard motor. Never let the sound of an engine or generator get in the way of crystal clear audio entertainment." 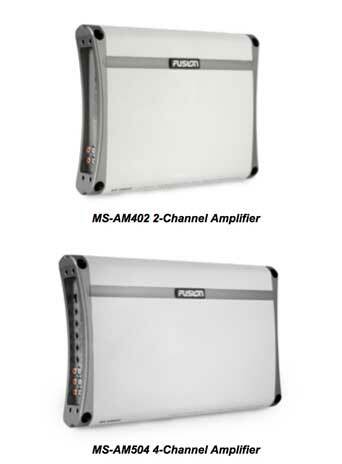 For more information on the MS-AM402 2 channel- and the MS-AM504 4-channel marine amplifiers, FUSION or its entire line of marine audio products, contact 623-580-9000 or visit www.fusionentertainment.com .